Adventurous pupils from schools from across the district were presented with their Duke of Edinburgh Awards by the Lord Mayor of Bradford at a ceremony to celebrate their achievements at City Hall last week. The pupils who have all completed either their Bronze or Silver awards were invited to the presentation afternoon, along with their parents, to celebrate and congratulate the students on their commitment and contribution to their local communities whilst developing their own skills and talents as part of the awards. Around 70 young people attended the event from Carlton Bolling College, Beckfoot Oakbank, Beckfoot Thornton, Beckfoot School and Parkside School. Welcome to the fourteenth edition of Educate Positive, a regular publication which highlights the educational excellence in education and across the district’s schools and settings. In this edition we look at the impact being made on young people’s literacy, two teachers from Steeton Primary who have been learning about the education system in Italy, as well as a Titus Salt student achieving the highest score in the country in Chemistry. This publication has previously reported about the STEM (Science, Technology, Engineering and Mathematics) provision and success at Titus Salt School. Another example of how this provision impacts on its students is the success of Year 12 student, Nicole Mitchell, (pictured) who not only received the highest possible award in the Cambridge Chemistry Challenge, but also achieved the highest score in the country! The Cambridge Chemistry Challenge aims to stretch and challenge students interested in chemistry. The challenge takes students significantly beyond the syllabus and encourages them to think about science in the way they would at university. Nicole’s first rate performance enabled her to attend a residential Chemistry camp at the University of Cambridge during the summer holidays. Well done Nicole. Bradford Council’s Visual Impairment Team which is part of the sensory service was awarded a quality mark for the work they do in supporting children and young people with visual impairment across the Bradford District. The award is made by regional heads of visual impairment services across Yorkshire and the Humber. It follows a lengthy assessment process which includes self evaluation and a whole day assessment by four external assessors. There are 39 visual impairment staff working across the District. Pupils with the severest vision loss attend two special centres which have additional resources at primary and secondary level. The team works with 179 children on the active caseload. The team also supports children and young people whose vision is less severely affected. Pictured above is the Visual Impairment Team. For further information please contact Anne Lomas, T 01274 439266. Standards in literacy are on the up says the National Literacy Trust, the charity behind the National Literacy Trust Hub in Bradford. Bradford is one of three hubs set up with the National Literacy Trust to provide coordinated literacy provision at a local level to drive up literacy levels in order to increase educational attainment, employability skills and improve health and wellbeing outcomes for our young people. The National Literacy Trust Hub in Bradford has engaged with the media on a number of elements showcasing the work being done to improve literacy across the district. The involvement with the media is an opportunity to increase awareness about the importance of literacy and to engage parents in their children’s literacy development. High profile figures in the district including the Chief Executive of Bradford Bulls, a Bradford City player and a local boxer have all played their part in communicating the importance of improving children’s reading and writing skills. Some of the Teen Reading Group with authors at last year’s Ilkley Literature Festival. For almost nine years teenagers in Bradford have been able to improve their reading skills thanks to the Bradford Libraries Teen Reading Group which was started back in December 2007. The scheme was as a result of the Fulfilling their Potential (FtP) Project, which looked at ways to engage young people in libraries. At the time there was no other such reading group targeted specifically at teenagers (12 – 14 year olds) and certainly none that brought together teenagers from various backgrounds and age groups. Adult book groups had proved to be very successful and the need for teenagers to have their own book groups became apparent, through consultation work undertaken with teenagers in five secondary schools in Bradford since June 2005. Reading helps young people to cope with the pressures of life, feel better about themselves and boosts confidence – all of which the Teen Reading Group can offer. This group has proved to be a success story for Bradford Libraries. It has met regularly every month since 2007, maintaining a core group of between 6 to 9 teenagers, meeting on a monthly basis. The initial cohort did fit the age group of 12 to 14 years but then many of the group wanted to continue. It was decided to open up the age range to older teenagers and now the group is open to 12 to 18 year olds. Both this and the fact it offers a reading group for teens from all over the district and from different backgrounds has increased its popularity and success. In October 2016 the Teen Reading Group is going to Ilkley Literature Festival and also the Alhambra to see “A Tale of Two Cities”, so another busy year is on the horizon. The group will reach its 10th Birthday in December 2017 and we look forward to celebrating ten years of supporting teen reading. For more information please contact Christinea Donnelly, T 01274 433915. Pupils in Steeton are learning about education in Italy following a job-shadowing visit by two of their teachers to a school in Rome. Teachers Diana Linford and Wendy Hardcastle from Steeton Primary School visited a school in Rome to see what schools in Italy are like. They worked with three Roman schools: IC Ferraironi, Romolo Balzani and Pisacane on a number of international eTwinning projects over the last few years. Their pupils have studied ‘Farming around Europe’ and the two World Wars together. The teachers received funding for the visit from Erasmus+, which provides money for staff and students to visit other schools in Europe, for education and training. Information for schools about Erasmus+ KA1 funding for staff mobilities and job-shadowing. For further information please contact John Cooper, headteacher, T 01535 653315. Two students from Beechcliffe Special School are now able to travel alone following training they attended which taught them the tasks and skills associated with travelling independently. Kieron and Harris, who are both 17 years old, attended the Travel Training at Bradford Council’s Shearbridge Depot. Travel training is a structured and planned course of training which helps children and young people make their first step towards independence. The Travel Training Unit works with disabled and non-disabled children and young people who require support, assistance, mentoring and training to plan and use walking routes and all forms of public transport including buses and trains. The Travel Training Unit supports children and young people on a one-to-one basis or in small groups planning and practising journeys. They also help with learning associated tasks and skills to enable students to travel independently to and from school. The Lord Mayor and Lady Mayoress of Bradford presented awards to two young people who have used a special travel training course to support their independence. Kieron and Harris, who are both 17 years old and attend Beechcliffe Special School, undertook travel training with Travel Training Unit based at Shearbridge and have now been travelling independently for six months. The Lord Mayor presented Kieron and Harris with a special ‘six months safe’ award at Beechcliffe Special School in Keighley on Tuesday 19 July. A teacher at Shirley Manor Primary Academy in Wyke, Bradford has won a prestigious national science award. Judith Carnelley has been chosen to receive one of the Primary Science Teaching Trust (PSTT) Awards for 2015. The awards celebrate the outstanding teachers in primary science doing incredible work in inspiring children at schools across the country. Judges said it is a major achievement by Judith, all the more so as they had considerable difficulty in choosing between the high-calibre nominations. Judith is a Specialist Leader in Education (SLE) for the Bradford Birth to 19 Teaching Alliance and has had responsibility for planning and delivering the science teacher training modules for Initial Teacher Trainees in 2015 and 2016. This has involved four cohorts of trainees attending Shirley Manor for hands-on science training and active learning with pupils. The awards were established in 2003 and they are presented during the Annual Primary Science Teacher College Conference, which this year takes place on 3-4 October in Bristol. This gives family, friends and colleagues the chance to join in the celebrations of these amazing teachers. A trustee from the PSTT will also visit Judith in school on another date to present the award. Teachers who win the award support colleagues in their own and other schools either locally, regionally or nationally to raise the profile of science. Maureen Neill, Headteacher at Shirley Manor Primary Academy, said: “Judith has worked at Shirley Manor Primary Academy (SMPA) since 2010 and has played a key part in our journey from Primary School to Primary Academy. She has embraced her role as Early Years Leader and Science Co-ordinator with great energy and enthusiasm. “In 2012 Judith led our school to achieve the Primary Science Quality Mark at Gold standard; we were the first Bradford Primary school to achieve this. Judith is now working as a regional Science Hub Leader and trainer for the PSQM (Primary Science Quality Mark). She also works alongside colleagues in STEM to improve local learning and research opportunities for local students and young people. Welcome to the ninth edition of Educate Positive, a monthly publication highlighting excellence in Bradford education and other topical news from across the district. In this edition we bring you the outcome of the Local Authority’s School Improvement Ofsted inspection; the proposed Bradford Education Covenant; Oakbank School’s success in the Good Schools Guide; and parents gaining skills to support their children’s learning at home, as well as other examples of achievement and good practice. Bradford Council’s Children’s Services School Improvement service was inspected by Ofsted in June as part of its routine inspections of local authorities around the country. In the published report Ofsted found evidence of a “step change” in Bradford Council’s approach. The report stated that the local authority had been too slow in driving improvement in the attainment, progress and attendance of pupils in the past, but it endorsed the Council’s renewed strategy and its school-led improvement plan. Ofsted identified a “cause for optimism” but it indicated that time will tell in terms of seeing the impact on results. Consistently good teaching and recent exam results have seen Oakbank School in Keighley receive two awards from the Good Schools Guide for out-performing all other English schools in its category and for displaying excellent performance. One award is for the highest performing English comprehensive school for girls taking Design & Technology Product Design at A Level; the other is for the highest performing English comprehensive school for boys taking the Fitness Trainer Training at VRQ Level 1. More than 5,000 children and young people have so far been involved in the National Literacy Trust Hub in Bradford, which works in partnership with Bradford Council and other local partners to create long-term change where low levels of literacy are entrenched, intergenerational and seriously impacting on people’s lives. The initiative works with schools, public services, businesses, communities and cultural, faith and voluntary groups through the Bradford Literacy Campaign. Local role models and celebrities have backed a host of campaigns. 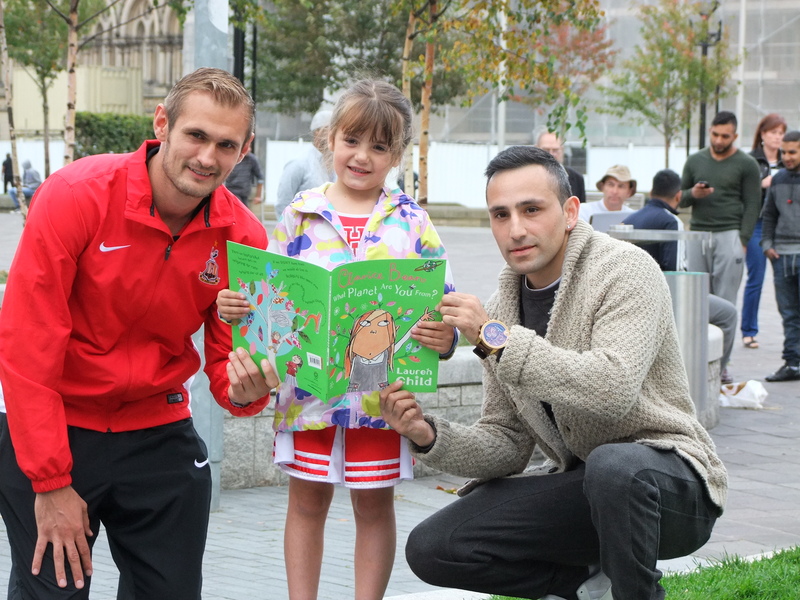 These include a book giveaway in City Park supported by Bradford Bulls, Yorkshire Cricket Club, Bradford City player James Hanson and boxer Tasif Khan (pictured above reading with a child in City Park) and fellow boxer Saira Tabusum. Tasif also visited a local school to talk about his favourite book to inspire teenage boys to read more. The Hub has also linked up with a hairdresser in Girlington who now encourages young people to read books aloud to him while they have their hair cut. A key priority is to encourage men to be actively involved in their children’s literacy by working closely with a group of dads at sessions in children’s centres. A reading selfie competition was launched on Father’s Day featuring Bradford Bulls chief executive Robbie Hunter-Paul which featured in the Telegraph & Argus. 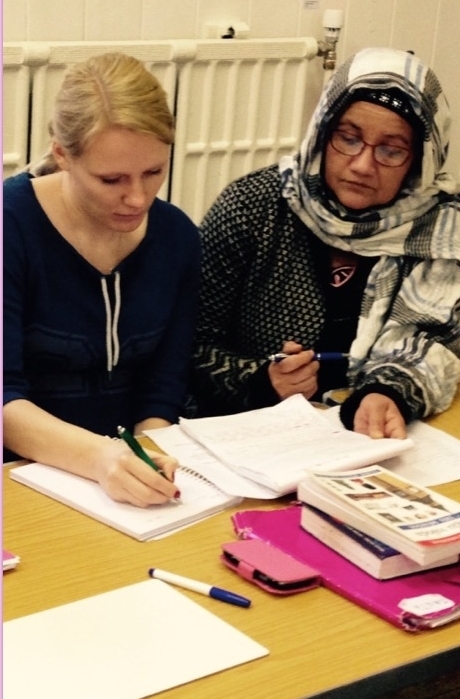 The Bradford Hub also works to improve boys’ writing skills. Contemporary poetry workshops were delivered to more than 150 pupils and a ‘Love Keighley’ poetry competition was launched. The Hub built links between two madrassas and local schools resulting in children performing their pieces at the international Saif-ul-Malook festival in Bradford. The Bradford Hub offers free support for every school in the district to develop outstanding literacy provision through the National Literacy Trust Network. The National Literacy Trust’s Premier League Reading Stars Programme (PLRS), which uses the motivational power of football to inspire children, particularly boys, to enjoy books, was rolled out in 26 schools. All boys who participated in the PLRS programme made more than expected improvement in reading, with three boys making the equivalent of a year’s progress or more after completing the ten sessions. Staff and students at Immanuel College took part in their own election to vote for the greatest Yorkshire person, as opposed to a political candidate. Pupils had to research the “great” they were voting for, which increased their own knowledge while also learning the process of an election. The school set up a polling station in its library. The overall winner was Ben Parkinson, the paratrooper who has been recovering from his deep wounds after being badly injured by a huge anti-tank mine. The Bishop of Bradford, the Reverend Dr Toby Howarth, announced the winners. In second place was Bradford’s own magician Dynamo, and in third place was pop star Ed Sheeran. Pupils at Westbourne Nursery had their first experience of transition and achievement at a very early age when they “graduated” at the end of the summer term. There were two ceremonies, one for the pupils who attend nursery in the mornings and the other for the afternoon children, for those pupils who will be starting Reception in September. They all received a graduation certificate and wore mortar boards and sashes in the school colours. Proud parents and carers made up the audience. 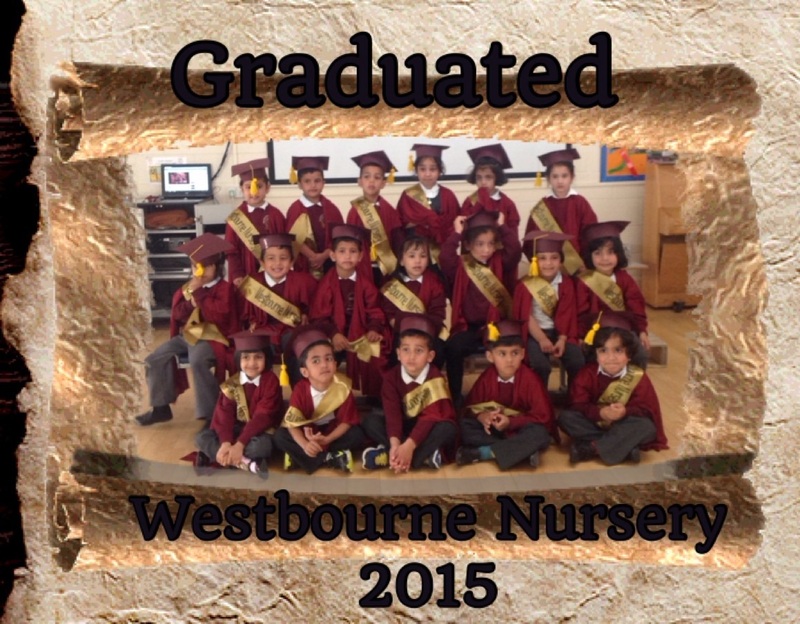 The next cohort of Nursery pupils is now settling in well to school life at Westbourne. For further information contact Belinda Wardle, Headteacher, 01274 483138. Families whose children attend St Matthew’s CE Primary School have benefited from the school’s “open door” practice which led to the school achieving the Engaging Families Award. St Matthew’s has provided a wide range of workshops, meetings and more academic courses which help parents to support their children as they progress through school. Courses included Family Life, Life Education, Keep Fit, Oral Health, Pilates, Cook and Eat and E-safety. The active Parents’ Forum also gives parents the opportunity to have direct influence in the school. For further information please contact Bob Curran, Headteacher at St Matthew’s on 01274 731693, or Sally Stoker, Headteacher at Saltaire Primary School on 01274 584093. Thirteen students from four of our schools have gained valuable employability and enterprise skills thanks to the work experience programme hosted by UKAR (UK Asset Resolution Limited). The students involved were from Holy Family Catholic College, Buttershaw Business & Enterprise College, Queensbury School and Carlton Bolling College. UKAR continues to make a contribution to youth employment in partnership with Xperience and Connexions. The students spent a week in different departments within UKAR to gain greater insight into the business as a whole and gain office environment experience. They also learned about apprenticeship schemes and the career routes available. For further information contact Catherine Halliwell, Lead Placement Officer for Bradford Council, 01274 385834. A number of parents of pupils from schools across the district are better placed to support their children’s learning and development at home thanks to the Family Learning courses the parents have attended. The Functional Skills English qualification is separated into three categories: Reading, Writing and Speaking & Listening. In the academic year 2014-2015 a total of 235 of these units were achieved by parents and carers. Some chose to do one or two of the three available categories. There were 48 who chose to do the full qualification which covered all three elements. Family Learning supports parents and carers to develop not only their own skills in maths and English but also skills which support their children’s learning. Pictured are parents from Allerton Children’s Centre. For further information please contact Vicky Clifton, Bradford Council’s Family Learning Curriculum and Qualifications Officer, T 01274 385938. In edition 6 of Educate Positive we reported on the increased take up of STEM (Science, Technology and Maths) at Titus Salt School. 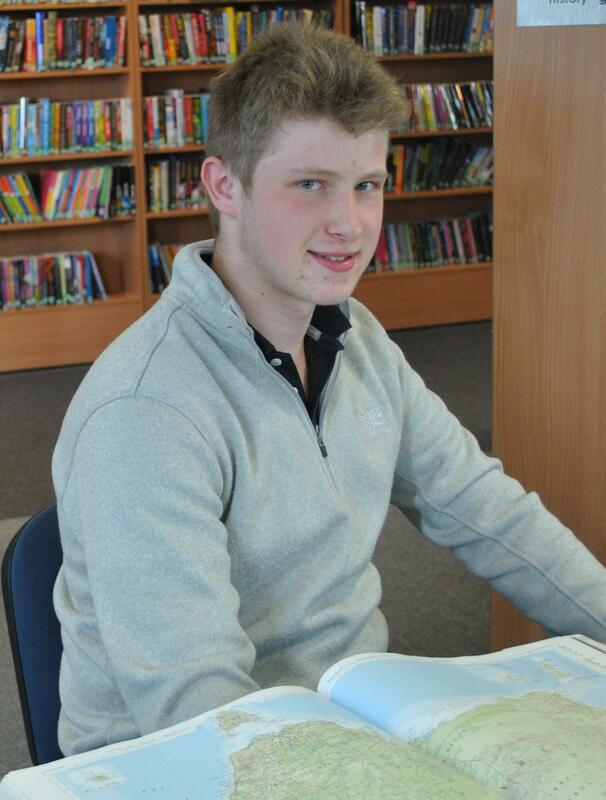 This increased interest has paid dividends for Year 12 student, Tommy Dobson, who is one of only five people in the UK to have won a scholarship to attend the renowned International Science School in Sydney (for the summer school). With support from the Ogden Trust, this once in a life time trip will see Tommy immersed in a visionary science programme for academically talented Year 12 students. Tommy will attend lectures by leading research scientists; experience hands-on brain expanding activities, explore the research labs, join in with a wide range of experiments and meet like-minded science mad students from all over the world. Every two years 140 top students from Australia, China, Japan, India, New Zealand, Singapore, Thailand, the USA and the UK, travel to Sydney for an unforgettable fortnight of science. Bradford’s Early Years pupils will benefit from a new technology project developed by three primary schools and the Council’s Curriculum Innovation Team. The Bradford Technology in the EYFS (Early Years Foundation Stage) Curriculum will help schools to use technology effectively in Early Years settings. The “curriculum development team”, made up of a consultant from the Curriculum Innovation Team, an independent consultant and staff from Blakehill and Greengates primaries, worked on writing the new curriculum, while staff from Worthinghead Primary demonstrated how schools and settings could implement the new scheme. As you can see in the picture to the left, Chloe is using a barcode scanner in the role play shop. The team launched the curriculum in Bradford through a series of four half day EYFS conferences with positive feedback of 96% good or better. Every practitioner who attended the conferences then took copies of the new scheme so that they could implement the ideas in their workplace right away. Worthinghead Primary School has been using ‘Technology in EYFS’ in its Reception class since September and feels that this access to technology is preparing pupils for the Key Stage 1 Computing Curriculum. The school is working on the Early Learning Goal scheme whose key message is that children see the links between technology and real life. The school tries to link technology and real life using role play. School also has QR codes that children scan to reveal prices in its role play cafe. 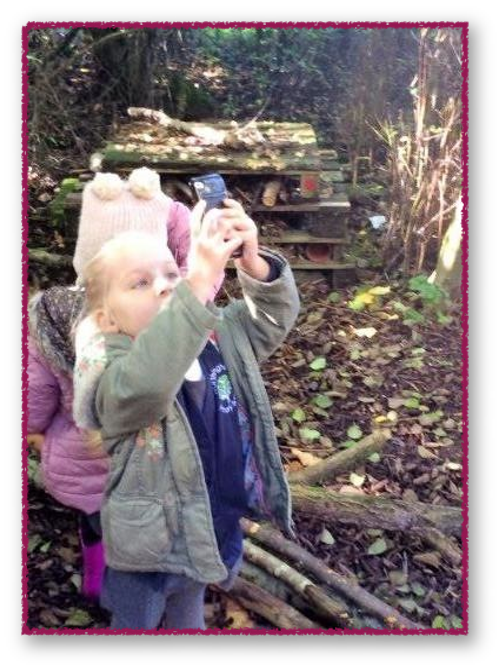 The children also take a selfie photo and their picture is attached to their work so that practitioners know which picture/work belongs to which child. Pictured right is Brooke taking her selfie. Bradford’s ‘Technology in EYFS’ has benefited children and staff. It has noticeably developed the children’s confidence and vocabulary. A group of Year 8 girls at Carlton Bolling College showed their gratitude to the teacher who had made a difference to their lives by nominating him for a BBC Radio Leeds Extra-Curricular Inspirational Teacher Award. Zaheer Jaffary had coached the girls at cricket and they had gone on to win the Yorkshire Championship at Headingley Stadium. Mr Jaffary, pictured left, won the award and was supported by many of the students who have been inspired by his superb coaching and guidance. Well done everyone and also to the Year 10 boys at the College who were also crowned Yorkshire Champions. Children at St John’s CE Primary School in Bierley are successfully having their voices heard in more ways than one. The school has introduced a novel approach to reading and writing with fantastic results; meanwhile the St John’s School Council recently showed their leadership and organisational skills when hosting a highly successful conference. The new way of teaching reading, writing and maths throughout the school has delivered improved results and the method has been disseminated to other schools in Bradford. St John’s has used its Pupil Premium grant to overhaul the way it teaches in Year 1 and boost the number of qualified staff at that level. It has introduced small group teaching and reduced the amount of time children spend in whole class lessons. The pupils are heard reading every day and they also take part in daily phonics and mental maths teaching in small groups. Improved Key Stage 1 results, developmental review findings and an external consultant report are evidence of the impact. Meanwhile the St John’s school councillors successfully organised a School Council Conference, attended by school councillors from Newhall Primary, St Columba’s Primary, Knowleswood Primary, Pudsey Tyersal Primary and Beckfoot School. They shared ideas on student leadership and the real difference that school councils can make. The St John’s councillors had been given a budget to work to when organising the conference, which included conference style stationery and a full buffet for attendees. Steeton Primary School is celebrating a national award for its linking work with a school in France. Its pupils have benefited from the “etwinning” work which has provided creative curriculum activities and enabled them to improve their knowledge of history and language. The school became part of the etwinning scheme in 2011, initially linking with a French school in Brest in a bid to provide relevance to the children in their learning of the French language. The school’s French teacher, Diana Linford, became an Etwinning Ambassador for Yorkshire with the remit to promote etwinning and curriculum collaboration across school. The school then led two projects in 2013 and 2014 which won UK National etwinning awards in 2014. School is delighted to report that it has also now been announced as the overall national winner for 2015. Another project “A Christmas Truce” was set up to commemorate the centenary of World War I. The project looked at the renowned football match between the troops where football and singing inspired joint acts of humanity. The school now leads on etwinning across the Two Valleys Learning Collaboration and in conjunction with its European Partners. Collaborative working between Bradford Council’s School Governor Service, the Leeds Diocese and headteachers has led to the development of a unique training package to ensure high quality governance across the Catholic Schools Partnership of Bradford and Keighley. Feedback has been very positive with governors feeling that the needs of the dedicated people who volunteer their time in school are being met through this development. The new training package includes multiple opportunities for training via a workshop approach, bespoke sessions and peer to peer support. Governors are able to attend other schools’ meetings to widen their experience and share good practice.